I opposed George W Bush’s invasion of Iraq. And, although I subsequently changed my mind several times, I opposed the invasion of Afghanistan in the beginning. As a teenager I opposed George HW Bush’s Iraq invasion too. My default position on war is against. As a good war movie will show you, war is hell. And it should only ever be a last resort. (This was one of the reasons I opposed the Iraq invasion of 2003. The other two key ones were: because international institutions matter; and the neo-cons clearly did not care an iota about the welfare of Iraqis, and in war motives matter for outcomes). Yet despite all this, I think I support what Obama is doing now, for very similar reasons to those that led me to supporting the bombing if Libya. The reason I support the bombing, and other logistical support for the Kurds (and possibly the Iraqi government), isn’t because ISIS/IS are odious (although they obviously are), or because I think they’re some existential threat to the West, or because I think the US is an altruistic defender of freedom in all instances. I support the bombing simply because if ISIS were to spill into Kurdistan humanitarian catastrophe would follow. And such circumstances are, I think, one of the few instances where military intervention is justified. Justified, because it will probably make things less worse. Not necessarily better, but at least less worse – less catastrophic. I had opposed intervention because, on the basis of this (still excellent, and worth listening to) LSE talk, I’d thought ISIS would be little threat beyond Sunni parts of Iraq. And that even in Sunni Arab Iraq they only held sway because of discontent with the Shia dominated (and more importantly ethnically oriented) government. And that with time their own hatefulness would see them removed in the best available way, by the Sunni Arab populous. Yet now this prognosis no longer seems right, at least in the country’s north and north east. The risk of ISIS sweeping into parts or all of Kurdish Iraq seems very real, and the potential consequences very bad. And so I think air strikes and logistical support are a good idea. My support is agonised: air strikes will bring civilian deaths even as they save them, and they are a ridiculously expensive way of saving lives (and more profit to the hateful military industrial complex). And, as Libya shows, intervention does not guarantee a happy ending. But if Gaddafi had been able to sweep over rebel areas things likely would have been worse still. And this is what I hope US involvement can stop in Iraq too. I’m not sure about any of this — this blog post isn’t a manifesto; it’s me trying to sort my thoughts — but for now, for what it’s worth, this is why I support what Obama is doing. Do transnational human rights organizations (HROs) influence foreign military intervention onset? We argue that the greater international exposure of human suffering through HRO “naming and shaming” activities starts a process of mobilization and opinion change in the international community that ultimately increases the likelihood of humanitarian military intervention. This is a special corollary to the supposed “CNN Effect” in foreign policy; we argue that information from HROs can influence foreign policy decisions. We test the empirical implication of the argument on a sample of all non-Western countries from 1990 to 2005. The results suggest that HRO shaming makes humanitarian intervention more likely even after controlling for several other covariates of intervention decisions. HRO activities appear to have a significant impact on the likelihood of military missions by IGOs as well as interventions led by third-party states. It’s hot, there is no wind, and the sun is starting to melt the day. I am sitting uncomfortably on the deck of a large leaf hut. In front of me are the leader of the local church and two village chiefs. They are asking questions in Pijin and I am doing my best to reply. I’m trying to concentrate. I need to concentrate, not just because of the language, but also because I need their permission to interview people about elections. It is less than 10 years since the Solomon Islands’ civil war swept over this part of Guadalcanal and the last foreigners to visit, who weren’t soldiers or police, were missionaries in the 1990s. So I am trying to explain carefully what I want to do and to reassure them. I’m trying, yet my efforts are being overcome by a distraction. An old, familiar distraction. Behind the leaders’ heads, out beyond the village, across the shingle beach, on the edge of the South Pacific, a line of swell is bending in around a point, steepening on a shelf of coral reef, and starting to break. I don’t have a board. I don’t surf anymore. And yet, once you’ve learnt how to read the sea, it’s hard to ignore. The swell is clean. The waves are mostly lefts. They aren’t perfect but they look fun. In my mind I’m surfing: trimming down the line, racing the wall, swooping through a cutback…The church leader notices me staring. He is a skinny, bumpy man, with a big, bald head and slightly sunken cheeks. His accent is strong and he speaks in anxious bursts of words that outwit my language skills. “Luk luk long si?” (You’re looking at the sea?) He frowns. And then, because this sounds stupid on its own: “Taem mi iang man mi laek ski lo waev.” (When I was young I liked to surf in the waves.) Ski, according to my dictionary, is the Pijin word for surfing. The easiest sentences in another language are the ones I expect. Anticipation helps when matching sounds to words. On the other hand, I struggle when sentences come out of the blue, even if I know the words being used. And in this instance I have no idea what the ‘sof’ means. Sof? I’m silent, trying to conjure sense from the sounds. And his smile is starting to fold back towards a frown. Sof? Sof? 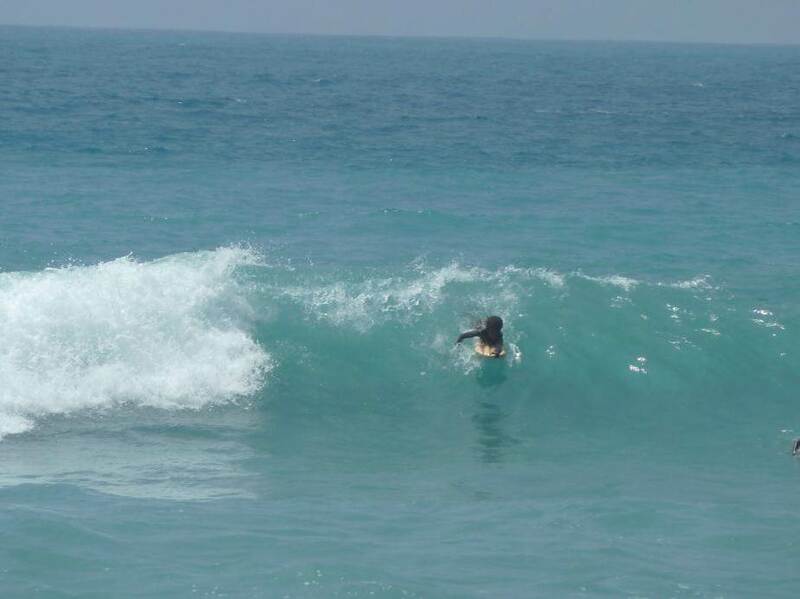 Surf! He’s talking about surfing. I can still remember the first wave I ever caught. I was thirteen. After school one day I took the bus to Nick Coney’s house and we rode pushbikes in our wetsuits through the rain to the local surf spot. Our boards were ‘pollies’: three feet long, surfboard-shaped polystyrene beach toys brought from a department store. The wave was a shore break, inside Wellington Harbour, that only broke in Southerly storms. We paddled out down the beach from the older kids on fiberglass boards and tried to surf. At first the ocean got the better of me: I missed waves; I got caught inside; I wiped out into churning, sandy water. It was icy cold. My lungs started to rattle with asthma. Then it happened, a steepening chunk of stormy sea rolled towards me, I spun around, and with a flailing paddle coaxed enough speed out of my polly to have a chance of catching it. The wave sucked me back, right to the critical point of its crest, and for a moment I hung there, on the edge of disaster. Then gravity took over and I was let go. Skimming, I flew down the face and out into the flats in front of the exploding swell. The white water swallowed me and then spat me out again. I shot towards the shore, lying prone, clinging to the bouncing piece of styrene foam and travelling faster than I ever imagined a wave would take me. I rode its surge all the way to the beach, where the swash carried me up the pebbly sand. There, I leapt up, giddy with happiness, and ran round in circles hollering victory to myself. I was so stoked. From that moment my path was set. I surfed my way through high school, getting a fibreglass board and learning to stand on it. I got my driver’s licence and escaped the harbour. I cruised through university choosing courses that left me free to surf. I worked a bit, saved, and spent six months in Indonesia, followed by a winter in the Canaries. I worked in London and surfed wherever I could. Frozen beach breaks in New York, points in New Hampshire, sandy tubes in Mexico, giant green walls in Madeira, hidden lefts in Chile. There were flat spells and broken boards. And there were crowds and long hours worked in lonely, grey cities. But, all things told, it was a good surfing life. Then, in 1999, while chasing waves off beaches of Harmattan-blown sand in the Cape Verde Islands, I caught dysentery, which led to Reactive Arthritis, an auto-immune disease, and surfing was replaced painful uncertainty. Since then ill-health has come and gone along with doctors, diets and medications. At times I’ve been well enough to surf, other times I’ve been unable to walk. Recoveries are slow, relapses happen overnight. And the inflammation has started to damage my body. In 2008 I had open heart surgery to replace my aortic valve, which had been wrecked by inflammation, and an acute relapse in the wake of surgery lead to permanent damage in my hip. I haven’t surfed a short board since then; I’m too slow to my feet. At times I’ve been able to longboard, but two hours of surfing are followed by a two days of pain. Worth it. But hard. By the time I made it to Solomon Islands, my hip and back were bad enough that I wasn’t even really able to longboard. I guess I could have travelled with a body-board, but that didn’t seem like surfing to me. I didn’t even consider it. Around all this the rest of my life has kept moving. Travel in developing countries sparked an interest in aid, and work for the New Zealand government’s aid programme. From this I became interested in Solomon Island electoral politics, and that became the subject of my PhD. Fieldwork was the start of a road of its own, taking my wife and I weaving from coast to coast and island to island through Solomons. In November 2011 we travelled along the southern shore of Guadalcanal: the Weather Coast. When it rains on Weather Coast, paths turn into rivers and rivers torrents. Some years it rains nonstop for months. Trade-winds blow clouds against the island’s jungle-tangled dividing range, and the water falls with a fury. The heart of the Coast is hemmed in between mountains and a shoreline of gravel beaches and surf bashed cliffs. There are no harbours and when the swell is big sea travel is impossible. When the winds blow and the rains come, villages become isolated, islands of their own, and people go hungry. Schools close and health clinics run out of supplies. The soil becomes too wet to grow anything except Swamp Taro. On fine days the Weather Coast is stunning – big, empty, and beautiful. But it is not an easy place to live. It isn’t far from the bustle of Honiara, Solomon Islands’ capital, which lies on the other side of Guadalcanal, but it might as well be another country. Indeed, Solomon Islands only became a country thanks to the colonial carve up of the Pacific. There was nothing resembling a nation there before the British arrived and drew lines around a bunch of islands north east of Australia, calling it a colony. Bundled into it were speakers of more than 90 different languages. Villages and clans were the only real coherent pre-colonial political entities and there were thousands of these. In Europe nations grew over centuries, in the Western Pacific they were dreamed up in days. Colonial rule in Solomons wasn’t as cruel or as bloody as it was in parts of Africa but it wasn’t a time of nation building either. Independence was granted in 1978 and shortly afterwards the logging companies arrived, corrupting politics with money. 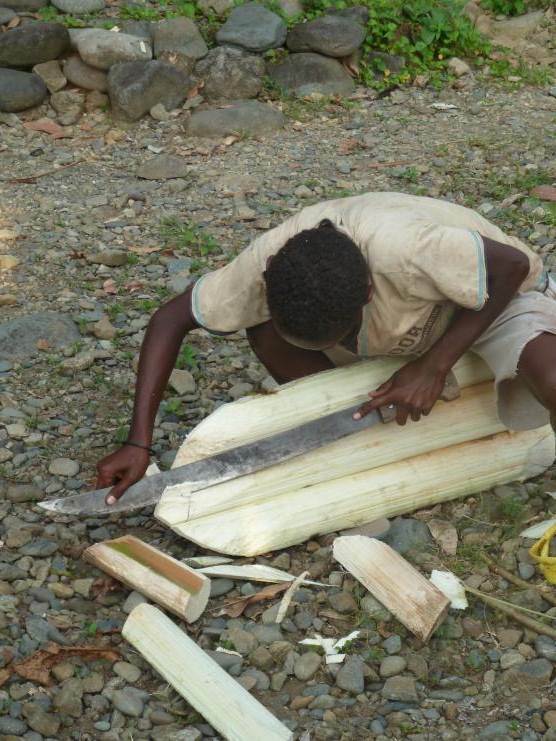 Life for ordinary Solomon Islanders got worse. In 1998, this led to conflict. Groups of young men from Guadalcanal drove migrants from the neighbouring island of Malaita off land on which they had settled. And the Malaitans formed their own armed groups. The inter-island conflict quickly reached a stalemate but at this point the armed groups of youths morphed into criminal gangs. On Malaita drunk young men with guns terrorised businesses. In Honiara armed groups extorted money from government departments. In rural Guadalcanal the Weather Coast had the misfortune of becoming a base for the most notorious of all the militant leaders: Harold Keke. Keke’s troops were based first at the eastern end of the Coast but, harried by armed police, he marched them west to a camp close to the surf spot that would distract me eight years later. I didn’t ask questions about the conflict years while we were on the Weather Coast, and for the most part people avoided the subject. We heard bits – in Keke’s home village our host kept apologising for not having cutlery, hers had all been lost when police burnt the village – but it was only near the village of the surf spot anyone offered me real detail about the time of Keke’s soldiers. Even then it was just one man. He can’t have been any older than me but he had the frail, stooped posture of a 60 year old. He spoke with a quiet, careful voice and one day he started telling me about Keke’s time at their end of the coast. Finally, after nearly five years of conflict, Australia led a peacekeeping mission into Solomon Islands. Australian troops swept up the Weather Coast, Keke surrendered and the militia disarmed. By that point no one wanted to fight anymore, least of all the soldiers, who were just village boys pumped up on power and promises of victory. Militia men went home to their gardens, and a few of the leaders went to jail. Keke is in prison. The conflict stopped, and people’s lives went back to normal. Which on the Weather Coast meant hard and isolated. When school ended on the afternoon of our first day in the village kids swept past our leaf house laughing and shouting, and pointing at us. Shortly afterwards a group of teenage boys arrived armed with large machetes. There was some hushed discussion in the local Ko’o language, and they raced off into the jungle, returning ten minutes later with the long slender trunks of freshly cut sago palms. Then the machetes were put to work. Trunks were cut into three foot long pieces and their green outer layer sliced off. Underneath, the wood was light, white and soft, a bit like polystyrene. Then they cut long thin ‘nails’ from the branches of another tree and used these to pin the peeled sago trunks together into rafts about 18 inches wide. And then they carefully rounded the fronts of their rafts. The result was three foot long, light and kind of surfboard shaped. A lot like the polly that I had caught my first wave on all those years ago. “Now they can teach you how to surf” John, the church leader said laughing. I wasn’t sure that trying to go surfing with the local kids was the best way of convincing him that I was a serious researcher. But, on the other hand, he looked happy, and there was still surf. It had been a long time since I’d ridden waves. A light onshore had come up but the surf looked alright: small and shifting about the reef, bumped up by wind wobble. The young teenagers couldn’t speak much Pijin and I didn’t know any Ko’o but we didn’t really need to communicate what we were going to do next. I grabbed the board I was given and, along with about ten of the teenagers, paddled out into the line-up. I wish I could tell you about the great waves I got, and how I amazed the locals by getting barrelled on the inside, but the ocean got the better of me that evening. A three foot long 18 inch wide board is fine when you’re thirteen, but I almost sunk mine. Without flippers I couldn’t kick effectively and if I tried to paddle into waves the board would twist out underneath me. I didn’t catch a single wave. The locals, on the other hand, caught plenty. They knew what they were doing, scooting around sliding into anything that broke. That night, covered in mosquito repellent sitting under the waning light of a solar powered lamp, I asked John who had taught them about surfing. “No one. Kids here have always known how to surf”. And so it was, one day I spoke to an ancient old man who told me he’d surfed the reef with his brothers just after the Second World War. Each generation of kids would learn from their older siblings. They’d learn how to ride waves when they were six or seven, eventually giving up in their late teens. Surfing wasn’t considered an adult sport, although the older men did still catch the occasional wave in their canoes as they paddled home after fishing. John and I spoke some more. They’d never seen fiberglass boards or anyone stand on a surfboard. The only other foreigner who’d tried to ride waves there was a missionary in the 1980s or 90s who’d been made a sago palm board like me. I asked John if they’d ever seen a surfing magazine. They hadn’t. All that they knew about surfing came from a few photos of men riding waves inside a bible printed by Australian Christian surfers, delivered to the village by a friend of the wave riding missionary. It was the bible that had also given them the word ‘sof’, their attempt to pronounce ‘surf’. That was their sole connection to the rest of the surfing world. Everything else they had learned about riding waves had evolved in isolation. Convergent evolution is the term biologists use to describe the process through which different species evolve similar features via natural selection. It explains why hummingbird moths look almost identical to hummingbirds. In an environment rich with nectar filled flowers high up trees there is a niche to be filled by a creature that can hover and extract the nectar. So both a species of bird and a type of moth evolved to fill the niche. Bird and moth look remarkably similar. Form follows function. And, I thought to myself, the next afternoon as I tried again to catch waves, something similar to this explained a lot of what I saw around me. Much that would be familiar to a surfer in Wellington, or Cornwall, had evolved in in the village too. The kids would paddle out through the channel behind the peak – the easiest and quickest way to the line-up. When large waves broke in front of them they duck dived exactly as you or I would do. 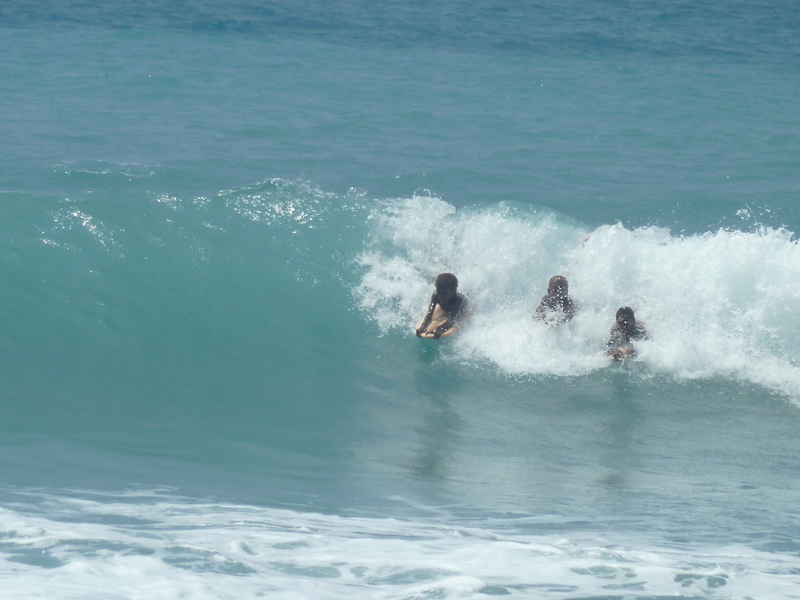 The kids surfed waves too, rather than white water, and they rode along them angling across the face. Some things were different. No one stood on their boards. And in between waves I was told tales of the crocodile that had moved into the swamp in the next bay. This, I thought anxiously, was something I hadn’t had to worry about back home. The biggest difference though, was how friendly they were. 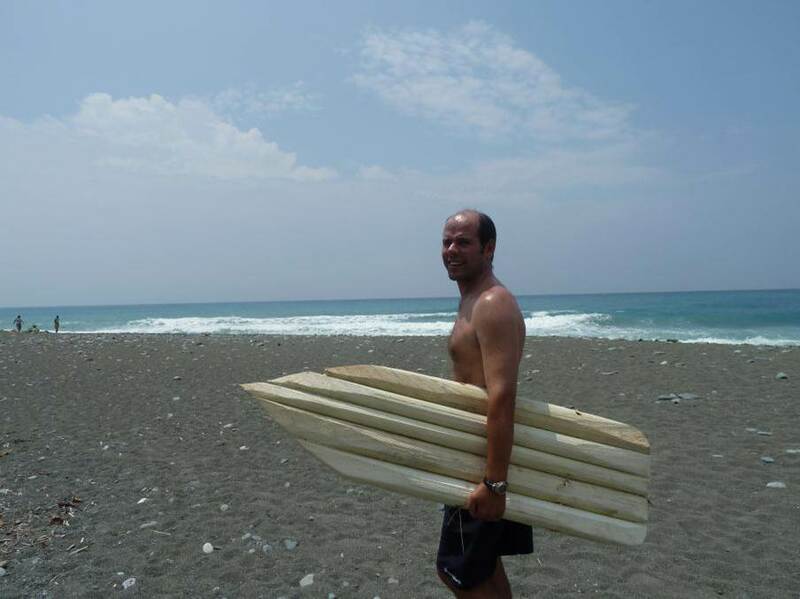 While they despaired of my surfing ability they kept offering tips and they made me a board. There aren’t many surf spots on Earth where a chubby, limping beginner would be welcomed, let alone offered pride of place. As I mulled this over, my thoughts were interrupted – the tropical sea finally sent a wave straight to me. I barely needed to paddle. The wave pulled me back, up to its crest, where I hung for an instant, and then let me go with the familiar sensation that every surfer knows: the start of a ride. Sago palm bouncing underneath me, I shot down the face, clinging to the board, marvelling at how fast the water sped by, just inches away. After the first ride, it became easier. 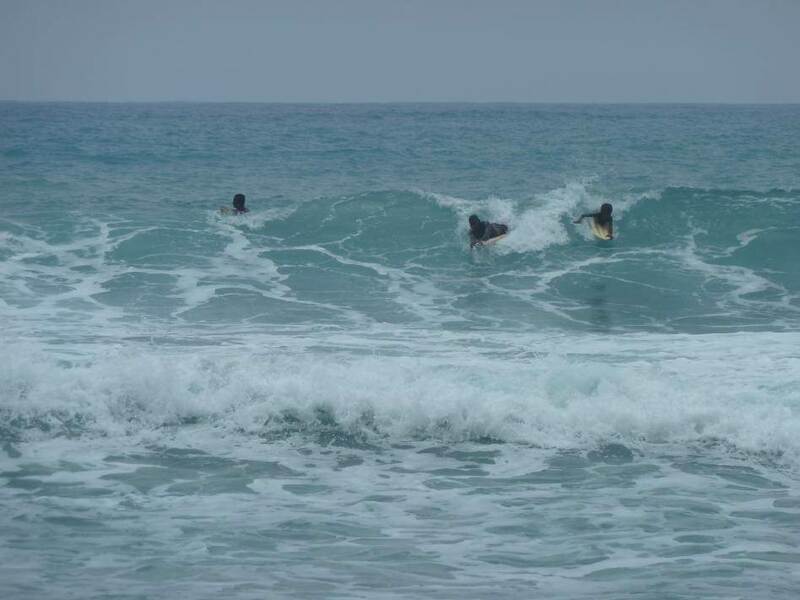 Along with my local companions I surfed for hours. Later, I stood on the beach, holding my board while the evening light folded gold over the mountains behind the village, and I thought about things. My muscles were aching in a pleasant, exercised way. I was stoked. Riding waves lying down would never bring me the same happiness that surfing had but it promised a lot more joy than a life spent trying to forget about the sea. And so I decided that I would become a body boarder for the time being. As I thought about this, a slender woman with a shock of curly hair strode down to the beach and started shouting at one of the kids still in the water. She waved her hands and he called something back. She shouted some more. The conversation was entirely in Ko’o but I knew exactly what was being said. 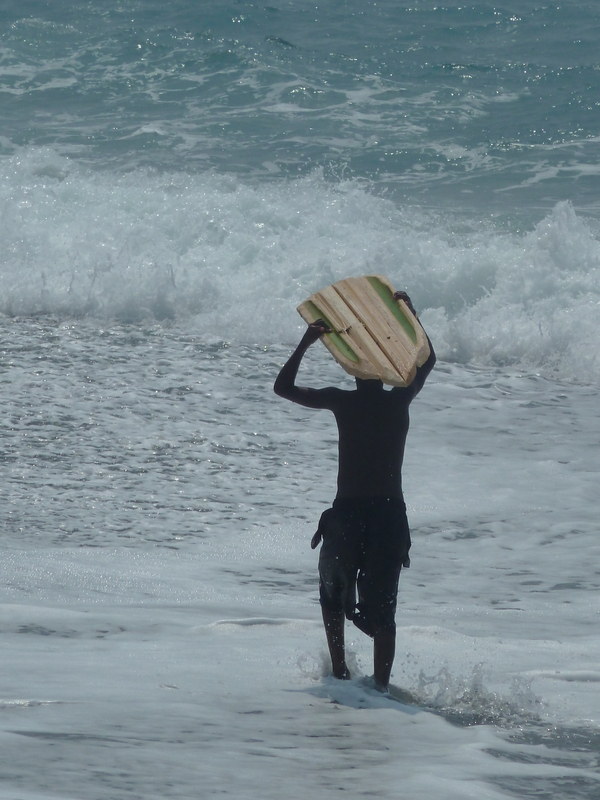 In a world of conflict and poverty, the freedom to surf is a tiny, trivial thing. And yet often it’s the trivial things that thread much of the happiness through our lives. Likewise, the tale of the point and its return from being a place of fear to a surf spot, is a small story when set amongst the on-going struggles of the Solomon Islands. But, small as it may be, it is also a happy story. From war to surfing. While his mother continued shouting, Henri paddled out to sea, spinning at the last moment to catch a set wave. He sped down the face, turned, and flew past section after section, taking that last ride the length of the point and into the sunset-coloured bay. Juan Cole provides the numbers on Iraq. A must read: Philip Gourevitch’s New Yorker piece on Rwandan road cyclists. A remarkably moving story of a country’s unsteady recovery from genocide combined with a series of touching personal tales. Above all though, it is an unintentional and yet convincing ode to Amartya Sen’s idea of development as enhanced substantive freedoms. If Dambasa Moyo, Helen Hughes and their like really care so much about the welfare of people in developing countries, why do they direct all of their ire at the ‘development industry’ and none of it at this industry? Having defended aid a lot recently, I should also emphasise that I also think aid can fail. There are some tasks that are simply beyond it, and others that are beyond it in some circumstances. And if it’s given poorly, it will almost certainly not help. First, the international community must recognize that the money it is pumping into Afghanistan is a primary source of corruption and conflict. Despite their very real needs, most Afghans consulted call for a reduction in aid to levels within the absorptive capacity of the country, because wasted aid assistance fuels corruption and predation. Equally important, the international community must ensure that aid produces tangible results on the ground and not simply be measured by the metrics of money spent within the fiscal year and units of production. The number of school rooms built is much less important than the number of children who complete the school year. The last US combat troops leave Iraq. For the time being? I only got half way through this before I gave up in despair. A gung-ho US neo-con shouting down a timid liberal while extolling a preemptive attack in the Middle East. Just like 2002 all over again. Although, in this case, the attack in question is one by either Israel or the US on Iranian nuclear facilities. Now I claim no particular expertise on the Iranian nuclear programme, but the threat it poses strikes me as about as large as that posed by Saddam’s illusory WMDs. If (and that’s a big if) Iran ever got the bomb I imagine it would be held as a deterrent (if you were part of the ‘Axis of Evil’ and you’d observed the respective fates of North Korea and Iraq, you’d probably be quite keen on one of those deterrent thingies too), and maybe as a leverage tool in negotiations. The reason I think this is the case, is that actually using the nuke against anyone else in the Middle East would lead almost certainly lead to Iran’s obliteration. And even the most despicable regimes tend to have an aversion to being turned into glass. So an unprovoked use of a nuclear weapon by Iran is something I think unlikely. True, despite this, Iran getting hold of a nuke is not a good thing – even a very small risk of someone in the regime loosing the plot and lobbing the weapon in the direction of Israel (or the Saudis, or Iraq) is not good. However, the alternative proposed by Reuel Gerecht – a preemptive strike on Iran by Israel or the US with quite likely major civilian casualties – strikes me as much worse still. Inflame tensions in a the Middle East tinderbox? (further) stoke anti-Americanism and anti-Israeli sentiment? kill innocent people? No thanks. We’re better off with the very small risk that is Iran getting a nuclear weapon and then actually using it. Infinitely better off. The way history, particularly the slave trade, conflict and colonial rule, interacted with ethnic cleavages serving either to exacerbate tension or ameliorate it. Strong functioning formal institutions which override some of the collective action dilemmas/issues of trust/issues of enforcement. This being a tricky chicken and egg problem, because in many cases the very problems of collective action resulting from ethnic diversity will undermine the establishment of such institutions. Interestingly, in their study Glennerster, Miguel, and Rothenberg find no evidence that the chiefly institutions of Sierra Leone succeed in negating the impact of ethnicity in Sierra Leone – either this is a result of methodological limits, or the answer is elsewhere. While its exact origins are uncertain, the popularity of the Krio language throughout Sierra Leone is clear. Speakers of the leading indigenous ethnic languages have adopted Krio, and Krio has had a major impact on spoken Mende and Temne as well as other languages. The widespread knowledge of Krio in Sierra Leone – despite the fact that the vast majority of adults in the country have no formal schooling – facilitates trade, communication and potentially cooperation across ethnic lines, as well as a common feeling of national identity. Maybe, although in Solomons and PNG Tok Pisin (Tok Pijin) plays a similar role, apparently without success in promoting collective provision of public goods. While violence in the PNG highlands is often between speakers of the same (first) languages. So I’m inclined to think that language alone will do little. Alesina, Alberto, Reza Baqir, and William Easterly. (1999). “Public Goods and Ethnic Divisions”, Quarterly Journal of Economics, 114(4), 1243-1284. Habyarimana, J., M. Humphreys, D. Posner, and J. Weinstein. (2007). “Why Does Ethnic Diversity Undermine Public Goods Provision?” American Political Science Review, 101(4), 709-725. Habyarimana, J., M. Humphreys, D. Posner, and J. Weinstein. (2009). Coethnicity: Diversity and the Dilemmas of Collective Action. Russell Sage: New York. Miguel, Edward (2004) “Tribe or Nation? Nation Building and Public Goods in Kenya versus Tanzania” World Politics 56:3, pp 327-362. Miguel, Edward and Mary Kay Gugerty (2005) “Ethnic diversity, social sanctions, and public goods in Kenya”. Journal of Public Economics. 89:11-12, pp. 2325-2368. Posner, Daniel. (2004). “The Political Salience of Cultural Difference: Why Chewas and Tumbukas are Allies in Zambia and Adversaries in Malawi,” American Political Science Review, 98(4), 529-45. Undermine Public Goods Provision?” American Political Science Review, 101(4), 709-725. Dilemmas of Collective Action. Russell Sage: New York. World Politics 56:3, pp 327-362. Kenya”. Journal of Public Economics. 89:11-12, pp. 2325-2368. Allies in Zambia and Adversaries in Malawi,” American Political Science Review, 98(4), 529-45. “He is wise who tries everything before arms” – Publius Terentius Afer. Should ever you start to doubt the wisdom of this adage, watch the Hurt Locker. It will set you straight. …but I’ve just been to a seminar on conflict and development and wanted to jot this down. The causes of conflict in developing countries seem complex and case specific, but are they? I’d hazard a guess that a simple model can explain the occurrence of at least 90% of conflicts. 1. Tension over resources. Either there’s not enough to go around or their distribution is unequal enough to offend people’s sense of fairness. 2. Overarching institutions which are either absent, or of insufficient strength and/or legitimacy to mediate the tension. Strength is required to bring parties to the table and enforce agreements. Legitimacy is required to ensure buy-in to the solution. Overarching institutions which very strong may be able to quash conflict even if they are illegitimate – however, the results with be despotic. Overarching institutions which are viewed by all parties as having real legitimacy may not need to be that strong to effectively mitigate conflict. 3. A pre-existing social cleavage. Not essential but it certainly helps. If people are from different ethnic groups, or tribes, or geographic areas, humanity’s innate suspicion of the other will make it much easier for items one and two to contribute to conflict. Of course, even if explaining conflict is simple, resolving it remains very, very difficult. An essay to read: Arundhati Roy travels in India’s Dandakaranya forest with Maoist insurgents. Elegant anger. And if you’re like me, who never met a Maoist other than the occasional ideologue at a university, it’s an eye-opener. First lesson – it’s not ideology that’s powering the rebellion, it’s injustice. Second lesson – if you don’t want Maoist insurgents in the countryside (and I certainly don’t) stop riding roughshod over the rights of the ordinary people who live there. It’s crazy after the horrors of the last century that anyone would take arms in the name of Chairman Mao. Crazier still though, the ways which the indigenous people in the essay have been shafted by the state. It’s hard not admire Roy’s bravery and commitment. That being said, I’ve never agreed with everything she says. And there’s two things about the essay that seem wrong to me. One, she underplays the atrocities of the Maoists. You could argue this is a counter to the way the rest of the media underplay the atrocities of the Indian State. But if you really want to get to the bottom of things the whole story must be told, I think. Two, in the solidarity and gender equality of the peasant militia, Roy wants to see the makings of an alternative. A fairer and more equal way. She sees something in the camaraderie and simplicity of the lives lived in the forest. And it’s true; as she tells it, the militia are a model of equality. The trouble is, it’s not so hard to organise small groups with shared values and beliefs, and facing an external threat, around the principles of equality and cooperation*. But it’s just not possible to do this on a society wide scale. I’m with Paul Krugman on this. Capitalism isn’t a moral way of running a country or the world. It’s not a particularly good way either. In fact it’s the worst way – except for every other system that’s ever been tried. I’m interested in alternatives to it, but I doubt we can do better in replacement than we can in reform. Aiming for a global Sweden if you will. *Actually, that’s not really true. It’s still damn hard, just not impossible.